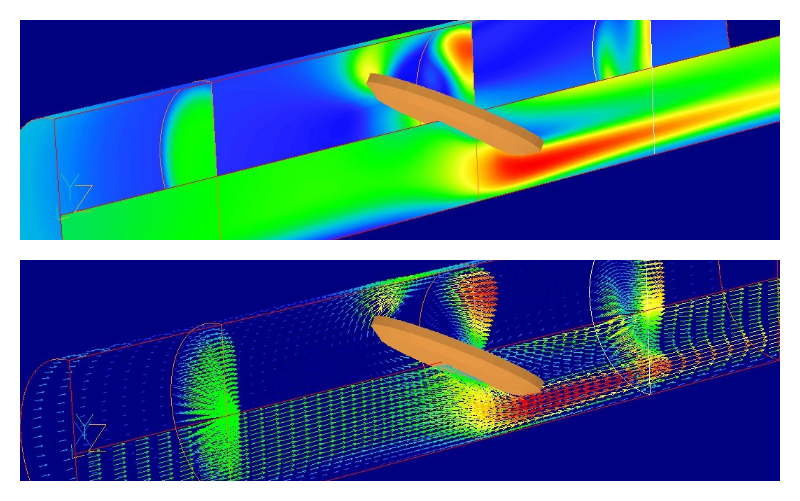 PHOENICS provides an accurate, reliable, cost-effective, and easy-to-use tool to simulate processes involving fluid flow, heat or mass transfer, chemical reaction and/or combustion in engineering equipment and the environment. 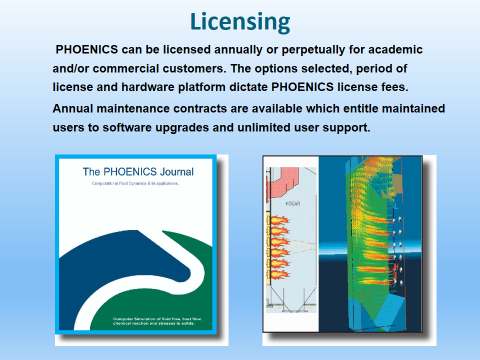 With the longest history of validation and a large user base, it is not surprising that PHOENICS has a proven track record in nearly every branch of science and engineering in which fluid flow plays a key role. 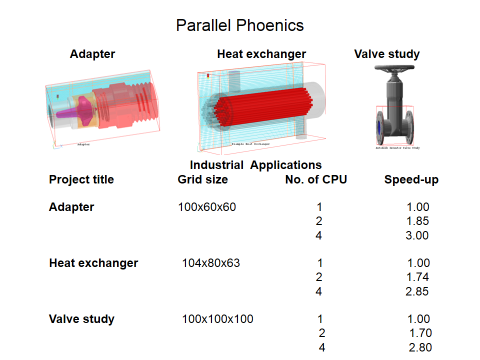 Organizations large and small use PHOENICS to improve their competitive edge in the research and development of products and processes involving fluid flow and heat transfer. Problem dimensionality: one, two and three dimensions. Time dependence: steady state and transient processes. Grid systems: Cartesian, cylindrical-polar and curvilinear co-ordinates; rotating co-ordinate systems; multi-block grids and fine grid embedding. Subsonic, transonic and supersonic flows. Flow in porous media, with direction-dependent resistances. Convection, conduction and radiation; conjugate heat transfer, with a library of solid materials and automatic linkage at the solid fluid interface. 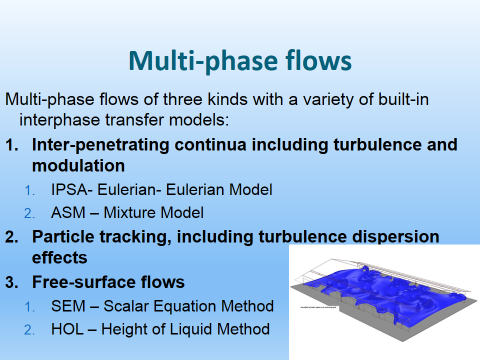 A wide range of built-in turbulence models for high and low-Reynolds number flows; LVEL model for turbulence in congested domains and a variety of K-E models, including RNG, two- scale and two-layer models. Finite-volume approach on staggered or collocated grids, with 13 choices of discretization schemes for convection. 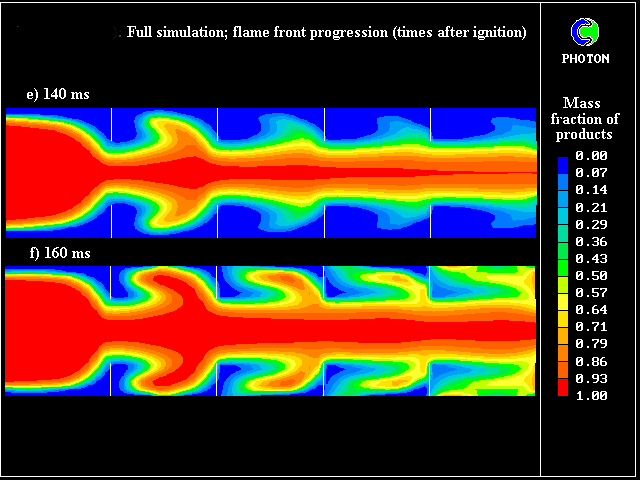 Combustion and Nox models, with a range of diffusion and kinetically controlled models including the unique Multi-Fluid Model for turbulent chemical reaction. Chemical kinetics including multi-component diffusion and variable properties. Built-in interface to the CHEMKIN chemical database. Mechanical and thermal stresses in immersed solids can be computed at the same time as the fluid flow and heat transfer. From its beginning in 1981, PHOENICS has been used for simulating processes involving chemical-reaction processes, and especially those involving combustion. It continues to be heavily used for these purposes. PHOENICS can handle the combustion of gaseous, liquid (e.g. oil-spray) and solid (eg pulverized-coal) fuels. PLANT, which enables users to introduce new reaction schemes and material properties by way of formulae introduced into the data-input command file, Q1. 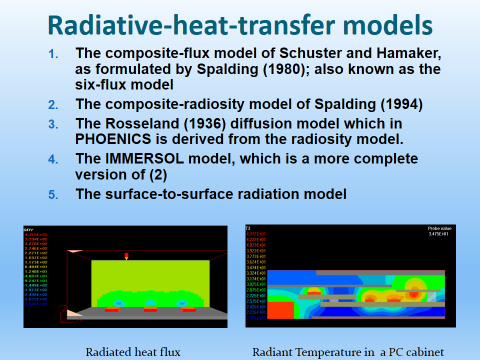 Thermal radiation is so important a mode of heat transfer that most codes have some means of simulating it. Only PHOENICS however possesses the economical and realistic IMMERSOL model, which calculates the radiative transfer between arbitrarily-shaped solids immersed in fluids which may or may not themselves emit and absorb radiation. • a layer of oil, floating on the surface of a river. 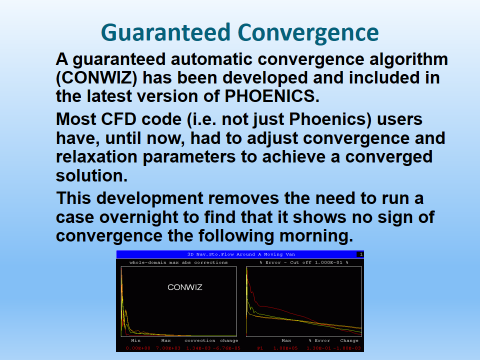 PHOENICS was the first general-purpose computer code to be able to simulate multi-phase flows; and it is still capable of doing so more effectively, and in a greater variety of ways, than most of its competitors. d. as a particulate phase for which the particle trajectories are computed as they move through a continuous fluid. (Eulerian - Lagrangian type method). 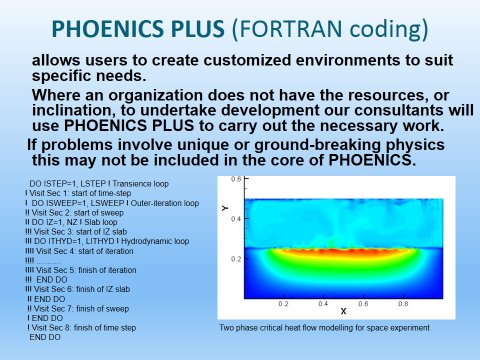 There exist many well-established computer codes for stress-analysis only; and PHOENICS is not proposed as a replacement for them. 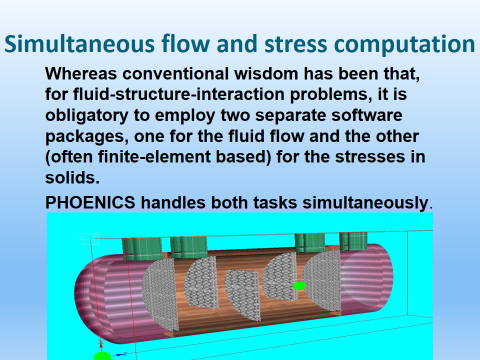 However, if fluid-flow, solid-stress and thermal interactions are all of significance, PHOENICS is the only computer code which can handle them all simultaneously. LAMINAR - The flow is laminar and there is no turbulence model. CONSTANT-EFFECTIVE - The turbulent viscosity is constant. The default setting is 200 times the laminar viscosity. LVEL - Generalised length-scale zero-equation model, useful when there are many objects and the grid is coarse. KOMODL - Kolmogorov-Wilcox two- equation k-f model. Useful for transitional flows and flows with adverse pressure gradients. USER - User-defined model for advanced users. KE Variants - Several variants of the K-E model usually giving enhanced performance for recirculating flow. KECHEN - Chen-Kim two-equation k-e model. Gives better prediction of separation and vortexes. KERNG - RNG derived two-equation k-e model. Gives better prediction of separation and vortexes. However, the user is advised that the model results in substantial deterioration in the prediction of plane and round free jets in stagnant surroundings. KEMMK - Murakami, Mochida and Kondo k-e model for flow around bluff bodies as encountered for example in wind-engineering applications. KEKL - Kato-Launder k-e model for flow around bluff bodies as encountered for example in wind-engineering applications. KEMODL-YAP - k-e model with Yap correction for separated flows. TSKEMO - Two scale k-e model for flows in which there is an appreciable time lag between the turbulent production and dissipation processes. Low-Re models - Several Low-Reynolds Number variants of the K-E model. KEMODL-LOWRE - Lam-Bremhorst low Reynolds version of k-e.
KEMODL-LOWRE-YAP - Lam-Bremhorst low Reynolds k-e with Yap correction for separated flows. KECHEN-LOWRE - Low Reynolds variant of Chen-Kim model. KEMODL-2L - Two layer k-e model, which uses the high-Re k-e model only away from the wall in the fully-turbulent region, and the near-wall viscosity- affected layer is resolved with a one-equation model involving a length-scale prescription. This saves mesh points and improves convergence rates. KOMODL-LOWRE - Low Reynolds Kolmogorov-Wilcox model. Others- A range of models, from simple one-equation models to Reynolds Stress (REYSTRS), including a Sub-Grid-Scale LES model (SGSMOD). MIXLEN - Prandtl mixing-length model. Simple model for unbounded flows. MIXLEN-RICE - Mixing-length model for bubble-column reactors. KLMODL - Prandtl energy model. One-equation k-l model for wall-dominated flows. Once imported, the objects can be moved, stretched, rotated, duplicated, grouped, given, attributes, hidden, deleted, etc. 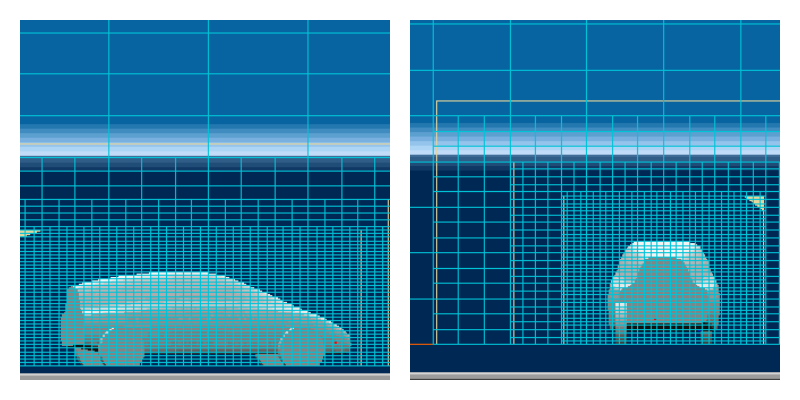 By default, after the objects have been placed in the desired positions, the grid adjusts itself to fit them optimally. Very often, CFD analysis is required for a situation which has been already defined geometrically by way of a Computer-Aided-Drawing (CAD) package. If the geometry already exists as CAD geometry files, a considerable time saving can be achieved through the use of PHOENICS-VR's ability to import CAD files directly. *.stl Stereolithography file. This is available in many popular CAD programs as an export format. ASCII and binary forms are supported. PHOENICS VR converts the CAD file to the PHOENICS-VR geometry format directly (or indirectly via SimLab) using the Datmaker utility. Below is shown an example of residential buildings displayed in the VR-Editor. The CAD file was created by way of the well-known AUTOCAD package. This CAD file in STL format was polished by PHOENICS, and then imported into PHOENICS-VR in a few seconds, rotated, and somewhat re-sized. 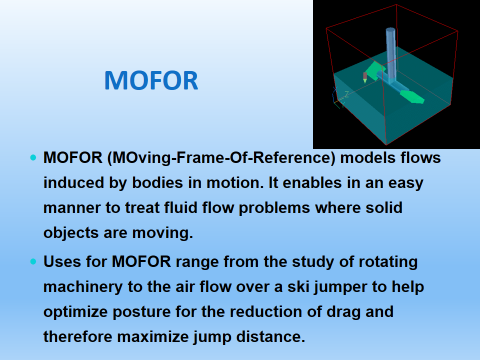 MOFOR is a feature of PHOENICS, which permits the simulation of flows induced by bodies in motion.It acts by moving, through the fixed computational grid, such momentum sources as will ensure that the velocities at locations within the body have the values implied by the prescribed motion. There is another important class of phenomena in which fluids are caused to move by motions imparted to the domain itself. A familiar example is the 'sloshing' of a layer of liquid in a tank which is jolted, tilted, or caused to oscillate. Such motions can also be handled by MOFOR. (2) providing equations from which their values can be deduced. 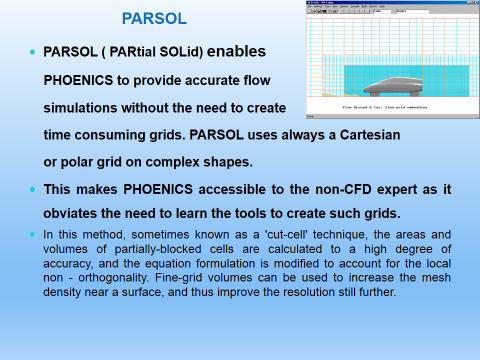 PARSOL is capable of calculating the fluid-flow phenomena with improved accuracy, whether the flow is laminar or turbulent, and whether heat transfer is present or absent. 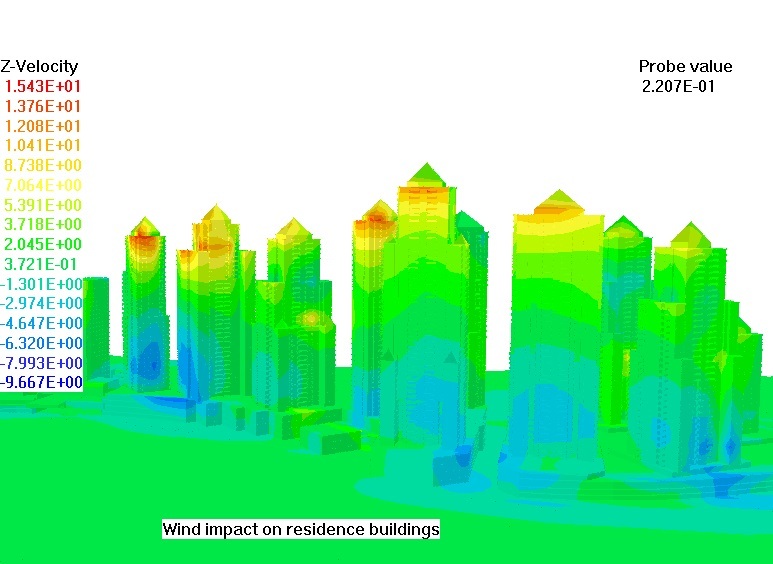 Accuracy of simulation often requires that the computational grid should be very fine around regions of the domain exhibiting steep gradients of temperature, concentration, density or other significant fluid property. In earlier versions of PHOENICS, this entailed also extending the fineness into regions where it was not required. Fine-grid embedding, now available, renders this unnecessary; for it is possible to refine the grid ONLY where necessary. to use finer grids than a single processor permits. The parallel solver shares the computational domain and task between a number processors; each processor then performs the computations for its part of the domain simultaneously. Thus the whole task may be achieved in a shorter time. In theory, the more processors used, the shorter the computer time will be. The following table shows the speed-up achieved when carrying out computations on a model with 20 million cells. 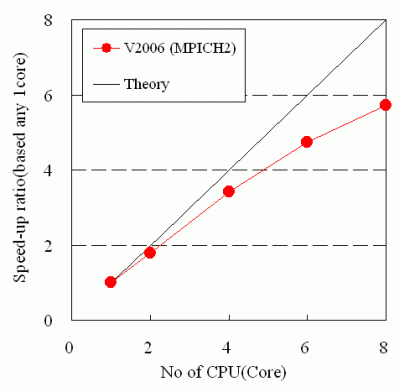 It can be seen that there is not a linear relationship between the number of processors and the speed-up ratio. This is because for each additional processor added to the computation pool, there is an additional overhead. Eventually a limit will be reached whereby adding additional processors does not lead to a faster solution time. What this limit is depends on the computational domain under consideration. The most complete CFD program from CHAM for analysis of processes involving fluid flow, heat and mass transfer, chemical reaction and combustion. Whereas other packages, and PHOENICS itself until 2007, allow the setting up of single instance flow simulation scenarios, the user of the new PHOENICS can set up classes of scenarios, of which sub-sets are selected by way of user-chosen parameters.